Researches using SPring-8 and SACLA are divided into proprietary researches, for which users are charged a beamtime fee, and non-proprietary researches, for which users are not charged a beamtime fee. For non-proprietary researches, project leaders are required to publish their research results in one of the following media and to register the published research results with the SPring-8/SACLA Publications Database managed by JASRI within three years after the end of the research term. When the experiments of a single research proposal do not yield publishable results, users may combine the results of the experiments of subsequent relevant proposals into one publication and register the publication of combined research results. (Users should provide all relevant proposal numbers when they register the published research results with the Publications Database.) In this case, research results must be published and registered within three years after the end of the first research term. However, research proposals, such as long-term proposals, that are assumed to be conducted over multiple terms are grouped as subsequent proposals and the deadline for the publication of such research results is three years after the end of the last research term. In the event that users cannot publish their research results within the three-year deadline, they may request a deadline extension. Please refer to the section “Deadline extension for publication of research results”. To widely disseminate the research results and findings obtained using SPring-8 and SACLA to the general public and to promote the development of science and technology, JASRI launched the publication of SPring-8/SACLA Research Report in 2013. It is considered equivalent to a refereed journal. Reports on the results of challenging research can be published even when the experiments and analyses of results of the proposed research failed. This will increase the opportunities for providing researchers with useful findings and encourage more researchers to attempt challenging research within the synchrotron radiation community. For better quality of SPring-8/SACLA Research Reports, submitted manuscripts will be thoroughly reviewed and followed up by JASRI until they are published to ensure that they include sufficient information on research results and experiments. However, when the author refuses to revise the manuscript or leaves it unrevised for more than one year without any valid reason, the submission may be considered withdrawn. 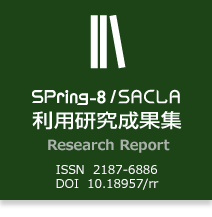 The majority of articles in SPring-8/SACLA Research Reports are published in Japanese at present. On the other hand, there is a growing movement among publishers of medical journals to allow secondary publication in English in other English journals for the articles that have already been published in Japanese in the aforementioned medical journals. JASRI also allows secondary publication of the articles in SPring-8/SACLA Research Report in other academic or scientific journals under certain conditions ensuring that the articles in SPring-8/SACLA Research Report are given priority as the original articles. This will help the scientific and technical findings published in SPring-8/SACLA Research Report to be widely disseminated to researchers and experts in science and technology fields both at home and abroad so that the research results obtained using SPring-8/SACLA will contribute further to the advancement of academic research, science, and technology, and the sustainable development of human society. In the event that users cannot publish their research results within the three-year deadline from the end of the research term owing to special circumstances, they may request a deadline extension by submitting a completed extension request form to the SPring-8/SACLA Research Results Review Committee of JASRI (hereinafter, “the Committee”) for each research proposal between 12 months and three months prior to the expiration of the deadline. A two-year extension of the deadline will be granted upon approval by the Committee. 1) The manuscript has been accepted, but not yet published. 2) The expected results were not obtained (but further experiments and analyses during the extension period will help produce publishable results). 3) Long-term research project (but publication is expected during the extension period). 4) Other special circumstances: serious illness/injury, pregnancy/childbirth, fire, natural disaster, etc. It is unacceptable to request a deadline extension for the purpose of obtaining a patent or commercialization of an intellectual property. If an extension is not granted, users are required to submit the research results to SPring-8/SACLA Research Report by the due date. In the event that users cannot publish their research results within the two-year extension period (five years from the end of the research term) and that they meet the conditions listed below, they may submit a completed re-extension request form to the Committee between 12 months and three months prior to the expiration of the extension period. Two additional years of extension of the deadline (re-extension) will be granted upon approval by the Committee. 1) The manuscript has been accepted and will be published within about six months. 2) Research results are expected to be of sufficient scientific and technological significance at the time of request for re-extension. Also, the problems hindering the publication of research results (such as problems in samples, experimental methods, experimental equipment, and analyses) are clear and can be solved so that the research results will definitely be published in a journal or other media during the re-extension period. 3) Neither the project leader nor any of the project team members can publish their research results in any form of the above a), b), or c) owing to special circumstances such as serious illness/injury, pregnancy/childbirth, fire, and natural disaster. In any of the above cases, the request will be reviewed by the Committee. Users are required to present evidence supporting the above circumstances and to provide prospects for the publication of research results in the request form. When there is a need for further explanation or information, the Office will ask users to provide the necessary information. In this deadline extension system, any request for deadline extension of more than seven years from the end of the research term will not be accepted. In order to further promote research activities at SPring-8 and SACLA, including challenging research that requires a long period to complete, it is essential to ensure the continuous stable operation of SPring-8 and SACLA and to ensure the use of a high-quality beam at the multiple beam lines. It is, therefore, extremely important to maintain a high level of accountability to the public regarding the use of SPring-8 and SACLA, since these large-scale advanced facilities have been constructed and are managed at considerable public expense. It is reasonable to require users of SPring-8 and SACLA to proceed with research beyond the re-extension deadline after explaining the progress of their research in SPring-8/SACLA Research Report by the re-extension deadline and thereby ensuring its accountability, if their research project requires more than seven years after the end of the research term. When users cannot publish research results within seven years from the end of the research term, they are required to submit their research report manuscripts to SPring-8/SACLA Research Report to provide information on the research they have carried out up to that time.